The “Watsonian” vs. “Doylist” logic is used to describe something from “in-universe” or “out-of-universe” terms. Sometimes one works a lot better than the other. So, what’s another goofy supervillain whose gimmick makes no sense, and is as known for his weird outfit as anything else? Why, The Ringmaster, of course! The Ringmaster is more “useful” than Arcade in the following ways. The circus can go places, whereas superheroes have to enter Murderworld. The Ringmaster has a slight power of his own, the hypnotizing hat. The Ringmaster at least has basic henchmen. This silver age villain was the subject of the first team-up between Spider Man and Daredevil, so I have good memories of him. I’ll be honest. When writing it, I pulled the entire original set of antagonists I’d planned for Todd’s Super Racket Adventure and replaced them with quickly shoved-in goofballs and homages to 90s video games. I feel it was the right thing to do, for having villains who I wanted to be serious in a book that was inherently silly and goofy would have just cheapened them without really adding anything to the “goofy, silly” part of the story I wanted. The villains I wanted originally will have to wait for another book, I suppose. I changed my avatar on some sites to a strange villainess. That would be Limstella, the second-to-last boss of Fire Emblem  for the GBA. To be honest, although I played the game as a child and loved loved loved it, at the time I only saw her as one boss among many. Now, I’ve grown to like her more. I think it’s the character design applied in greater detail by both official and fan artists giving her the semi-androgynous, creepy look with more justice than a 16 bit portrait. Ok, I think I’ve found the superhero with the best rogues gallery, in my opinion of course. Spider-Man, and not just because I grew up with him and he was my family’s favorite hero. I think there’s two big reasons. A good power set. Spider-Man is in a sweet spot, strength-wise, where you can pit both low-end nominal humans and strong supervillains against him without it seeming too implausible. This isn’t like (and I know I’m using DC here) Superman where his foes have to be either cosmic or kryptonite-based, or a Daredevil/Batman/Punisher where they have to be weaker. The lack of an “evil counterpart” for a while. Evil counterparts are tricky. They have to eventually lose, but they’re symmetric so the fights frequently become less than ideal. The Hulk (Abomination) and Iron Man (A parade of power-suited villains) are notorious for this. It took Spider-Man decades to get a direct evil counterpart in the form of Venom, and even he’s better than most. This, mixed with silver age creativity, makes Spidey’s villains memorable. Sadly (or maybe not sadly), Marvel has had an aversion to making new villains for a while. I’ve heard part of it is a reluctance by writers to create something they won’t have financial or creative control over, but that doesn’t explain all of it. I think it’s just because the comics themselves are doubling down on being niche, while the movies still have decades of material to mine. So, reading the latest entry in Marvel’s new Elektra series, I began to fill with rage. This was bad-and not the sort of enjoyably bad I can chuckle at, this was-bad bad. Ok, at least I can have fun screaming at it. I’ll admit the only reason I read it was because it had Arcade in it, making me perhaps the only person to check out comics for that character. And maybe I shouldn’t have. It’s awful. Terrible. Turgid. Has no sense of fun for what should be a zany trip to Murderworld. Arcade is working for the Kingpin and he’s rambling, and Elektra’s rambling, and the whole thing is an unintentional parody of an unintentional parody of Frank Miller’s classic style. It’s eighth-rate noir (suddenly, This Is The Police doesn’t look so bad) interspersed with a deus ex machina-resolved fight against an Arcade-piloted giant robot that only served to remind me of Arcade’s far superior portrayal in Ultimate Alliance. There’s no reason for this series to be here. And this brings me to the next topic of this post. There is an unmistakable comics diversity problem. It’s just not that kind. I think there is a diversity problem in comics, but it has absolutely nothing to do with what the characters are. No, it involves an excessive diversity of titles that dilute and get tangled in each other. Elektra got involved in a wave of Daredevil spin-offs around the same time. Is there really a need for this? Really? And this is just the tip of the iceberg. To return, one footnote that shows how twisted and tangled this whole comics mess is that there were multiple recent low-number Elektra titles. It took me a bit of effort, I can’t imagine what it would be like for a comics neophyte. Like I’ve said before, superheroes are held down by comic books. You could argue they’ve outgrown them. The millions of people who bought Ultimate Alliance saw an Arcade far closer to his original form, and his character concept than the low thousands who bought the 2017 Elektra or his abominable butchering in Avengers Arena. And for that I’m thankful. 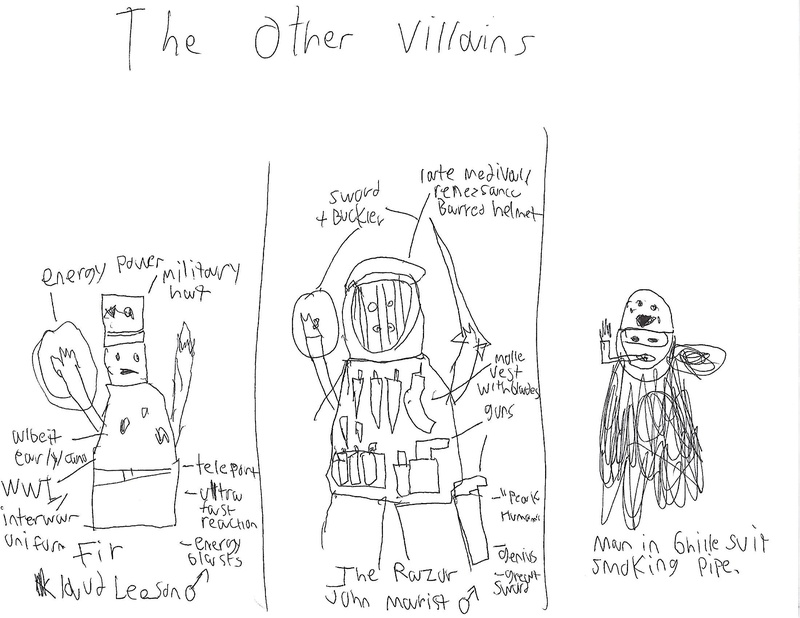 So, I took my drawing “””skills””” and made more supervillains that have been in my mind. Fir (pseudo-German for “four”, I did find an early 1900s pan-Germanic conlang that had it as four, so that works) is the final member of the Dead Hand. I put off drawing him for so long because I knew exactly what he looked like but didn’t have the drawing skills. Fir is, to be honest, an homage to the Kaiser Knuckle General, who is himself a rip-off of M. Bison from Street Fighter. So I guess it’s a rip-off of a rip-off, down to the powers? Fir came in fully formed, fighting in a pseudo-WWI and wearing a uniform to match (I wanted a field style one to distinguish him from the General’s ornate one.) Ok, he looks like a first graders attempt to draw Charles de Gaulle. The Razor. The helmet makes him look worse. 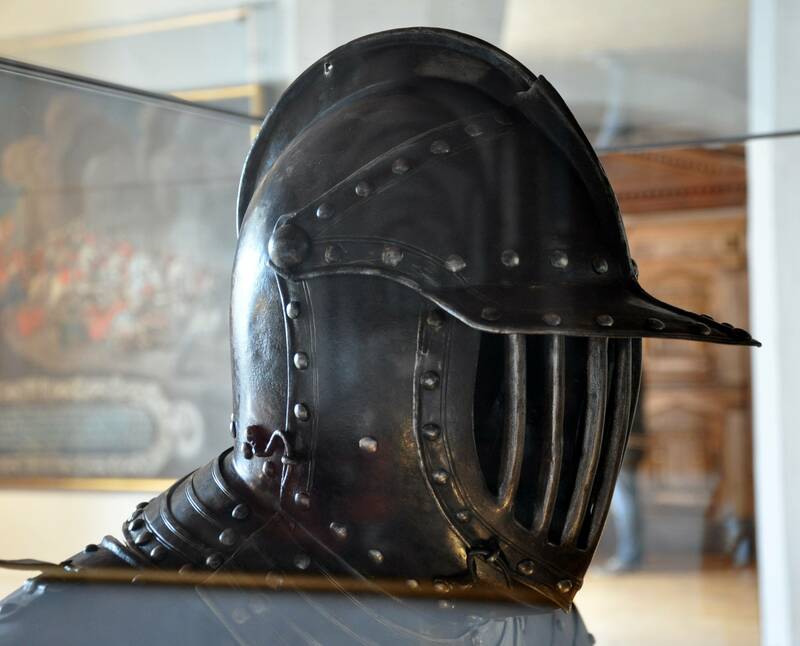 I imagined a ski mask under a barred helmet, like this or this. The Razor has a backstory. See, he started off as a minion supervillain a long time ago whose power was——–ready——he had a knife. That was it. Now he’s a sort of Charles Atlas genius combined with a walking arsenal of guns and knives who serves as the initial villain of an outline I’ve written. Finally, the man in a ghille suit smoking a pipe. There was going to be an evil military commander there with a MacArthur style pipe smoke, but I both lacked the skill and didn’t yet have a clear theme. So I added a camo helmet, a scribbled-on ghille suit, and kept the pipe. Maybe he’ll become a more prominent character. I dunno.